If you're a project manager with a job interview on the horizon, you need to be ready to answer questions about previous roles you've held. You'll likely experience a combination of behavioral and situational-based interview questions aimed at revealing your leadership, communication, and organizational skills. Interviewers are eager for candidates who are natural leaders, and work well with others. Be prepared to provide examples of difficult team members you've worked with as well as unsuccessful projects you've been a part of. Avoid getting negative in your response to those questions. You'll likely also be asked about your project management failures and successes. The following is a list of frequently asked interview questions for project manager positions. Take the time to practice these answers, so you appear polished during the job interview. You might even want to use your mobile phone to record your responses. What are the most important qualities of a project manager? Tips for answering: In your response, keep in mind the specific requirements listed in the job description. Plus, if there were any challenges that the interviewer brought up previously in the conversation, you can form an answer that reflects how you would deal with those challenges. What specific training have you had that would be relevant to this project manager job? If you had to rate project management as a career, from 1-10, how would you rate it? Tips for answering: While you want to be honest in your response, please do not be negative. An interview for a project management role is no time to give the career a low mark! Do you have any certifications that are relevant to this position? Tell me about the projects you have managed. Tips for answering: Employing the STAR technique—where you frame your answer in terms of Situation, Task, Action, and Result—can help you give a cogent and meaningful response. Tell me about a full project life cycle that you managed and what was included in this project. Which project management software and tools do you prefer using, and why? 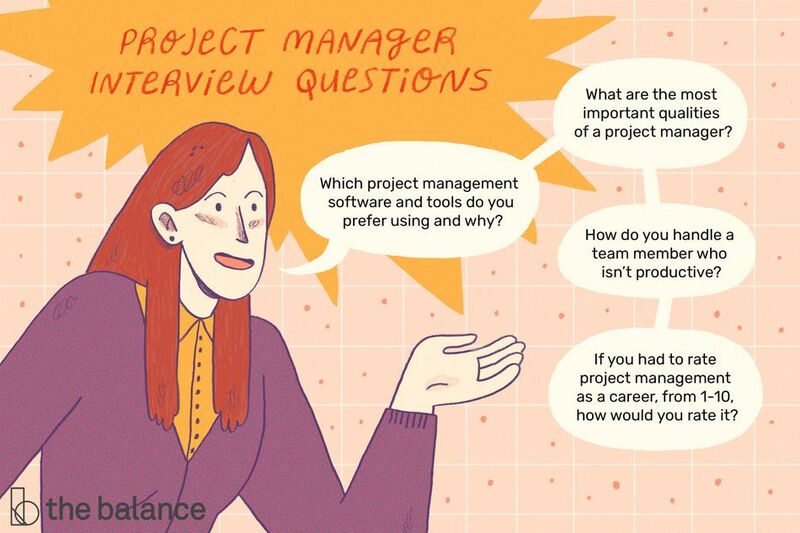 Tips for answering: Most likely, interviewers are most interested in your reasons for liking a particular type of software, and what your preference expose about you as a project manager. The one potentially tricky aspect of this question is if the company does not use your preferred software. You may want to mention that you're comfortable with several types of software to your response. How do you go about planning a schedule for a project? How do you handle office politics? Tips for answering: Do be honest, but stay away from anything that reflects poorly on you as a potential employee. What is your preference for providing status updates? What is the best way to set up and manage an interdepartmental team? How do you motivate a team? How do you handle a team member who isn’t productive? Tips for answering: If possible, share an anecdote about how you handled a situation like this in the past. When was the last time you didn’t delegate? What was the consequence when you didn't delegate? What was the most challenging aspect of your last project? What was the least challenging aspect of your last project? What type of contingency planning do you do? What do you spend the most time doing each day? Tell me how you schedule projects and establish timelines. How do you close a project? Tips for answering: Go ahead and brag a bit. Be specific about what went well, and how you were a part of that. A gracious project manager always remembers to note team members and relationships that helped fuel a project's success. What is the largest number of projects you have handled at the same time? Do you prefer working on a single project or multiple projects at the same time? Tips for answering: Be thoughtful about the role you're seeking to take on. If the company is notorious for having project managers juggle tasks, it just doesn't make sense to respond by saying you prefer working on a single task at a time.